At the Geological Society of America meeting a couple of weeks back, I attended many presentations that shared new scientific results (yes, including that now-famous talk about Mesozoic kraken). Some of these lectures I found quite exciting, and a couple were genuinely eye-opening. The eye-opening ones were about scientific work that is closely related to mine, but with results that were either quite different, or that said things that I really had not thought about. In other words, they were unexpected. As a paleontologist who works in an area that depends partly on the discovery of previously unknown fossils, you might think that I would not be surprised by new discoveries. After all, my job is partly to go out and find things that people have never found before. But how do I do this? I do it by studying where and how people have found other strange things, and by developing hunches based on where we have found unusual fossils. In other words, I am influenced by experience, and depend on my expectations. To be honest, most scientists follow well-worn paths. It is relatively easy to get funding for work that will obviously give good and publishable results, using tried and tested methods. Those of us who attempt other sorts of things tend to denigrate “cookbook” science, but there is no denying that the cookbook approach gets results. More speculative research may produce no outcomes worth writing about, and those trying to do that research may find it hard to get funding. Those who speculate successfully, generally speculate on the basis of what they might expect from their knowledge and experience. 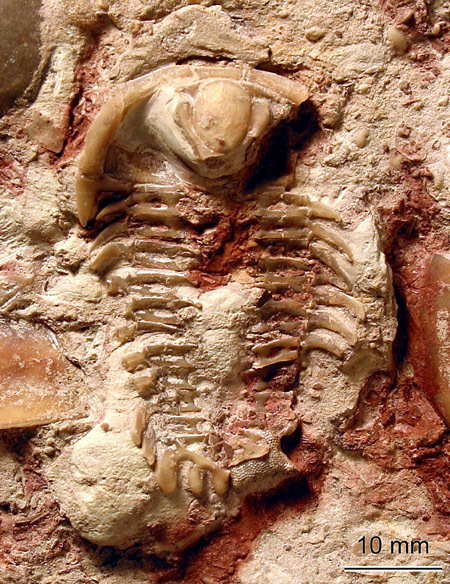 Those of us who study the rare fossils of creatures that lived along the margins of ancient seas do have expectations that are different from those of many other paleontologists. 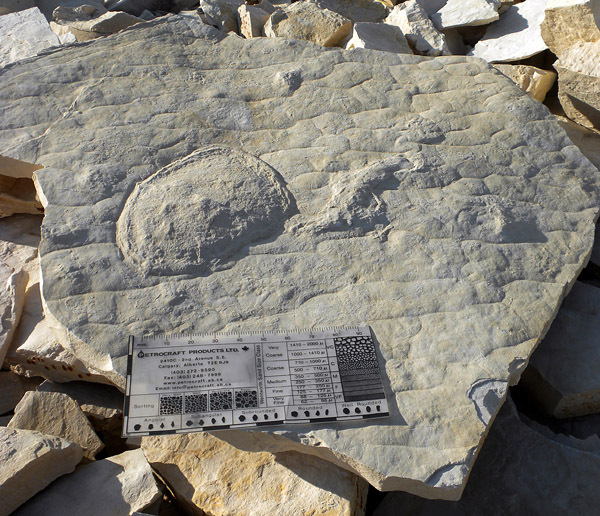 Many of our colleagues look for fossils where fossils have been known and seen in the past. These scientists go to known sites, where they scout for the groups that they want to find. As a result they might find crinoids at a site that was previously known for trilobites. This can, of course, be exciting and interesting, but you are unlikely to find unusual soft-bodied fossils at a site where the typical “normal” fossils are common and well-preserved. 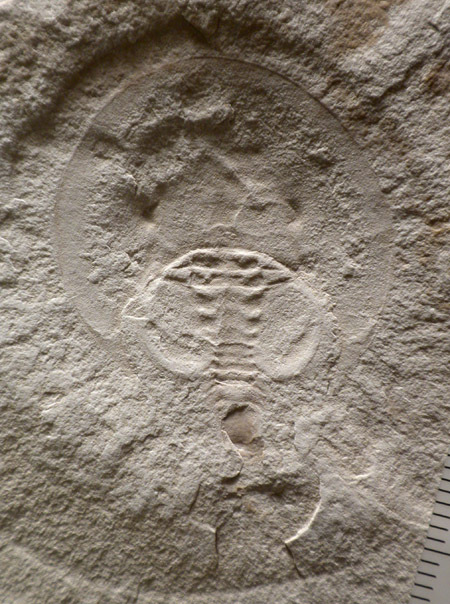 The trick to finding strange marginal marine fossils, such as horseshoe crabs and jellyfish, is to look in some of the places where fossils are not known to occur. When we go searching for these things, we look at sedimentary rocks that would be described by 98% of paleontologists as “barren and unfossiliferous.” In the past, we tended to stop the truck at this sort of outcrop, walk over the rocks for a few minutes, write them off as unproductive, and then get into the vehicle to drive on to the next outcrop. To find the fossils, we have had to cast off those previous expectations; instead of driving off, we patiently sit in one place and split the rocks until they yield up their treasures. Barren and unfossiliferous? These apparently unprepossessing dolostones at William Lake have yielded some very unusual fossils. But after casting off our old expectations, we rapidly took up new ones based on our fresh experiences. 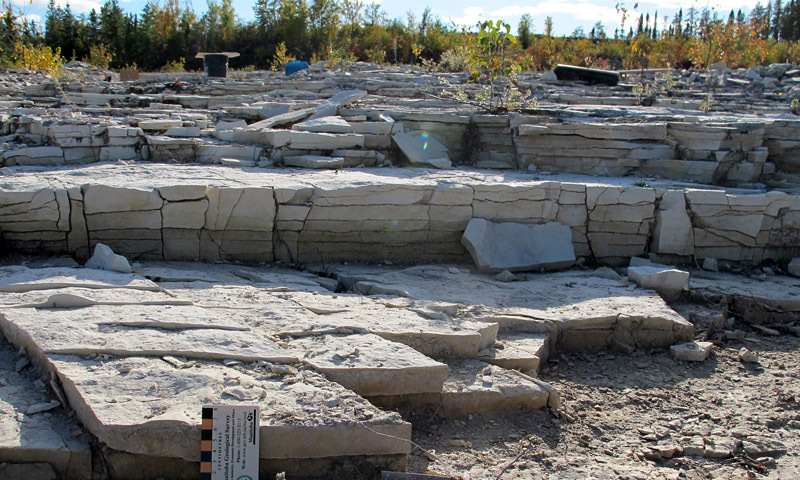 From our work at Ordovician sites in northern and central Manitoba, I had come to think that the marginal marine fossils occurred in a particular place in a depositional cycle. The rocks we see these fossils in were deposited as sediment, at a time when the ancient sea was becoming shallower. If we walk down the slope from one of our sites, we see that the older rocks below were deposited in deeper water and that they contain fossils that are more “normal marine” in aspect: cephalopods, corals, and bryozoans (“moss animals”). If we walk up the slope a bit, we see slightly younger rocks that were deposited under horrible, extremely shallow, extremely salty conditions. These may contain microbial mats, but they genuinely lack visible fossils, no matter how many bedding planes we split. Based on my experience, I felt that the part of the sea level cycle in between was the “sweet spot” for finding strange marginal marine creatures. Then, at GSA, I attended a fascinating presentation by Don Mikulic, about Silurian marginal marine sites in the Michigan Basin of the central US and Ontario (the Silurian is the next younger period after the Ordovician Period that I study). I had heard about these rocks and visited some of the sites, so I had some idea of their depositional setting. 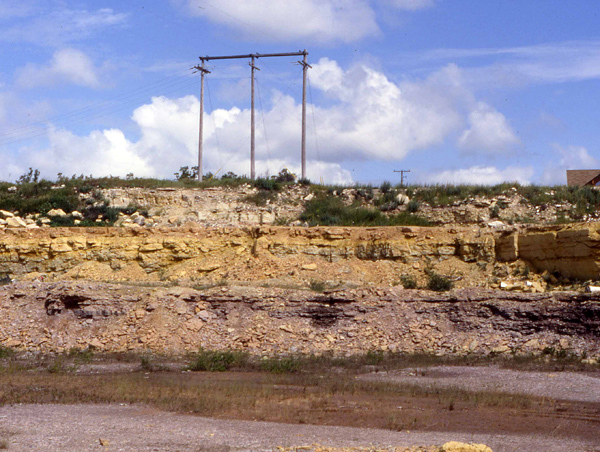 What Don did, however, was to place most of the known fossils (such as the famous Waukesha biota) into a coherent sea level cycle picture. And what this showed was that the unusual fossils did not necessarily occur as the sea was becoming shallower. Rather, many of them are found above unconformities: in places where the sea was returning to an area after it had been absent for a period of time, as sea level rose. When I first heard all of this, I briefly had one of those “oh s***” moments. But that passed quickly, and I felt energized and intrigued. Don’s explanation of the setting of those sites made perfect sense, of course, just as the setting we interpret for our sites makes sense. But it is a different kind of sense, showing that there is not a just single situation in which such fossils can occur. This means that there are many more places we should be searching for strange fossils in our own backyard (well, my backyard is Manitoba, which is a big yard, about the size of France!). It may also point toward some profound truths about sediment deposition, and how it differed through time and between sedimentary basins. Maybe the occurrence of unusual fossils will turn out to hold important untapped information about ancient environments. Expectations based on experience can be useful to scientists. They can help us to home in on what we seek, but that doesn’t mean that we should ever assume that they represent universal truths. The historian Thomas Kuhn coined the term “paradigm shift” to describe those sudden revolutions that take place in a science when its underlying assumptions are changed by new discoveries (the development of plate tectonics is often put forward as an example of this). Perhaps we need to recognize more fully that revolutions also must occur within the brains of individual scientists, if our science is to progress and develop. Thank you. I took a look at your page; Half Dome! That bunny is braver than I am. Another great article Graham! Love to examine “so call non fossiliferous” deposits… sedimentary rock that appears to be blank and unproductive…. sometimes yields wonderful surprises like a tentative soft body pyritized worm from black anoxic late Devonian shale deposits of Kettle Point formation (currently being studied at ROM) or a recent tentative Priapulid worm like critter (also being studied at ROM) from blank dolostone of Williamsville formation at Bertie Late Silurian Lagerstatte (hypersaline lagoon environment characterized by salt hoppers)…. and 3 weeks ago witnessed a rare significant find…. Silurian Acanthodii fish ( possible new holotype from this deposit) unexpectedly shows up at the Bertie found by an American (C.F.) who has generously made his intentions known that the fossil to be donated to ROM and hands me the fossil…. Yes, finding odd ball fossils can be fun and rewarding… the hunt always intriguing….. Thanks Peter. Yes, I think there are a lot of other unfossiliferous rocks out there that could produce interesting things! More thought provoking prose, and great pics of fossils! And just a quick comparative example from way ‘up section’ in the Eocene. 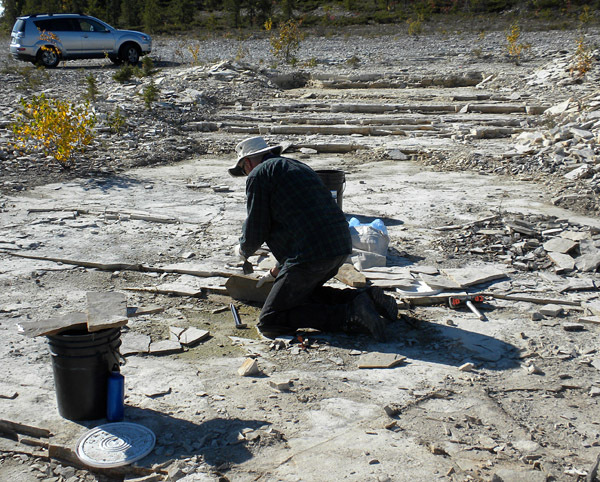 On my recent fossil collecting in BC we had a geochemist along, Gabe Bowen from Purdue University in the US. Gabe wasn’t interested in the lake-bed shales we typically sample for leaf fossils, but the sandstones … where he found a new leaf locality for us. Well, we were also investigating new sites and at a roadside exposure of a prominent volcanic ash bed Gabe and our students started digging away and found delicate organically preserved conifer shoots preserved within the ash layers. A very unexpected find as traditional ‘wisdom’ says the ash beds should be barren of fossils. Thanks David. I guess the basic point is that we humans tend to make up our minds too quickly about things. It has served us well in an evolutionary sense, but it may make us less good as scientists if our natural tendency is not to keep our minds open.